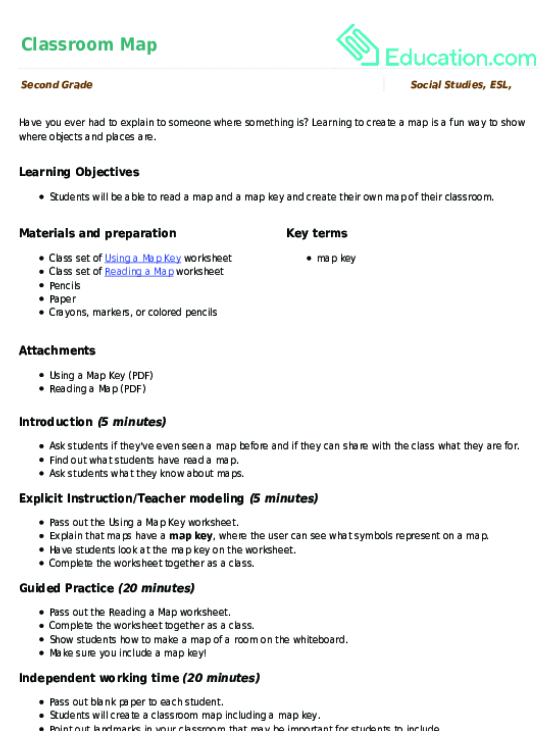 Students will be able to read a map and a map key and create their own map of their classroom. Ask students if they've even seen a map before and if they can share with the class what they are for. Find out what students have read a map. Ask students what they know about maps. Pass out the Using a Map Key worksheet. Explain that maps have a map key, where the user can see what symbols represent on a map. Have students look at the map key on the worksheet. Complete the worksheet together as a class. Pass out the Reading a Map worksheet. Show students how to make a map of a room on the whiteboard. Make sure you include a map key! Pass out blank paper to each student. 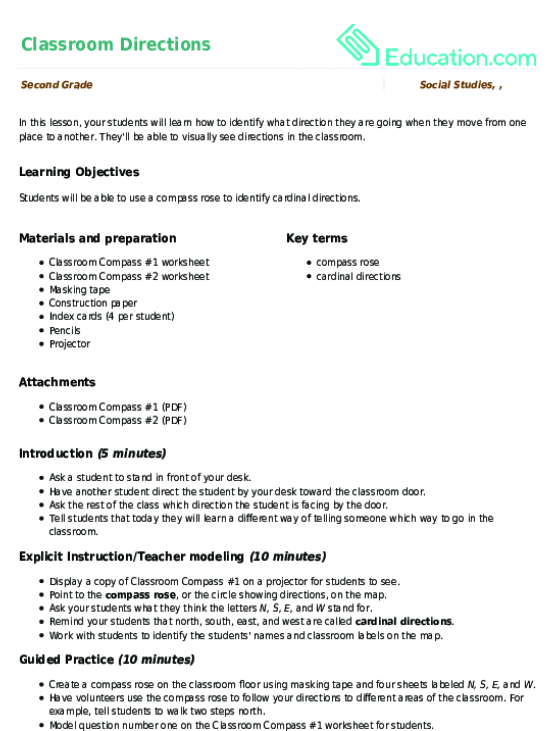 Students will create a classroom map including a map key. Point out landmarks in your classroom that may be important for students to include. Encourage students to get up and walk around the classroom quietly if need to get a better view of the classroom. Enrichment: Advanced students may make a map of the whole school. Support: Students may need to partner up with another student to help guide them with this assignment. Students will be assessed by the completion of their worksheets and the effort put into their classroom maps. Have students share their classroom maps they've created with the class. Have students compare and contrast maps. Learning to create a map is a fun way to show where objects and places are. They'll be able to visually see directions in the classroom. 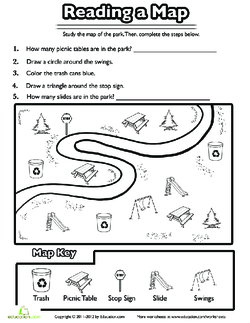 Use this worksheet to introduce your child to map scale. 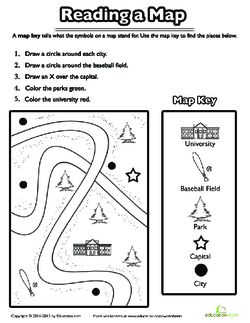 Go over this neighborhood map with your child or student to teach how to properly read a map. 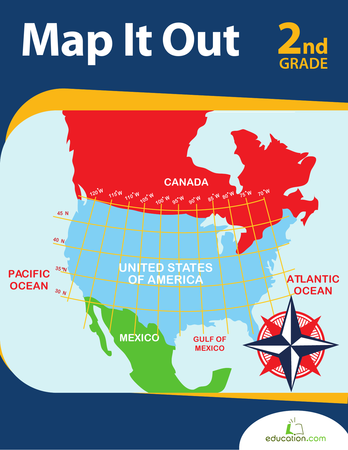 This worksheet provides a fun introduction to basic map conventions for 2nd graders. Introduce your second grader to map math with cardinal directions, map keys, and directions to Grandma's house.